Images of an iPhone that seems to be a prototype of some sort have been posted online, reports 9to5Mac. The iPhone may be a next-gen device, but it is just as likely a prototype version of the current iPhone 4 designed to test compatibility with China Mobile’s network. 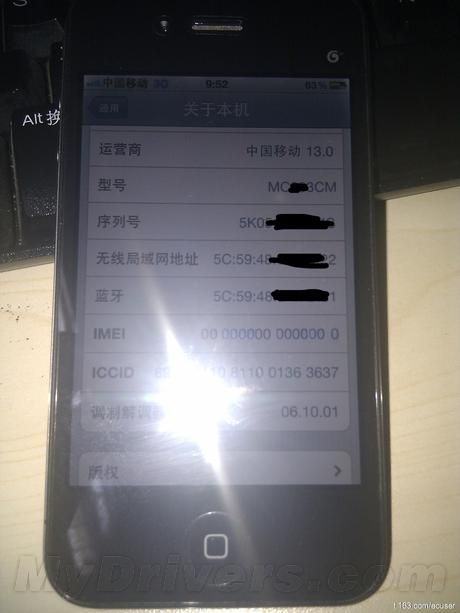 The prototype shows China Mobile as the carrier and appears to be running baseband 06.10.01. This is a new baseband that has yet to be released. This could be in preparation for running the phone on the China Mobile network. It also lacks an IMEI number, also an indicator of iPhone prototypes. Apple has been working with China Mobile to secure a deal for it to carry the iPhone, thereby opening up a potential market in the billions. Apple COO Tim Cook recently paid a visit to China Mobile’s headquarters, presumably to work on negotiating the deal. Read next: iPad HD for pros and redesigned iPhone 5, coming in September?